Ultra Music Festival 2017 Announces Phase One Lineup! ULTRA MUSIC FESTIVAL, which takes place this March 24, 25 and 26, at the end of Miami Music Week 2017, has lifted the lid on Phase One of its lineup. With some spectacular additions across all areas of Bayfront Park, and some exciting new changes to the status quo format, ULTRA 2017 is looking rock solid. ULTRA’s inimitable LIVE offering receives special attention for 2017, as it prepares to welcome some of the biggest names in Electronica, Hip-Hop and Pop to Downtown Miami. Headlining The World’s #1 Festival (DJ Mag) next March are a slew of chart-topping A-listers, including Ice Cube, Major Lazer, The Prodigy, Underworld and Justice, the latter of whom will be unveiling their brand new live show for the very first time in the U.S. As a brand that prides itself on providing its fans with a huge range of varying sounds and experiences, and with more acts of a similar stature due to be announced in the coming months, Ultra Music Festival has once again delivered an unmissable LIVE program. The ULTRA Main Stage will welcome back the crème-de-la-crème of the DJ world. International DJ headliners and fan favorites Above & Beyond, Afrojack, Alesso, Armin van Buuren, Axwell^Ingrosso, Dash Berlin, David Guetta, Hardwell, Martin Garrix, DJ Snake, Steve Aoki and Tiësto will all grace the imposing structure, which will once again be bigger and better than ever before. The site of many performances that have shaped the history of electronic music, fans can expect all the pyrotechnic and sonic grandeur from previous editions and much more. In a huge scoop for the RESISTANCE concept, the long-awaited return of Sasha & John Digweed will make its U.S. debut at Ultra Music Festival in March. This marks their first performance together in the U.S. since Ultra Music Festival 2010. Following this, the pair will embark on a world tour that will see them perform together at numerous other ULTRA WORLDWIDE / RESISTANCE events throughout 2017. In an exciting change that looks to satisfy the ever-shifting tastes of festivalgoers, RESISTANCE will take over TWO stages at Bayfront Park in 2017. In addition to Arcadia Spectacular’s mesmerizing ‘SPIDER’ structure return, the Megastructure also becomes home to RESISTANCE, with Carl Cox named its Official Global Ambassador. Carl, who performed at his first Ultra Music Festival in 2001, has curated the lineup in the Megastructure across Friday and Saturday and will headline proceedings on both days. RESISTANCE headliners so far across both stages include Carl Cox, Dubfire, Jamie Jones, Joseph Capriati, Maceo Plex, Marco Carola, Sasha & John Digweed and Tale of Us, with many more to be unveiled over the coming weeks. For more information on all RESISTANCE events, visit resistancemusic.com. 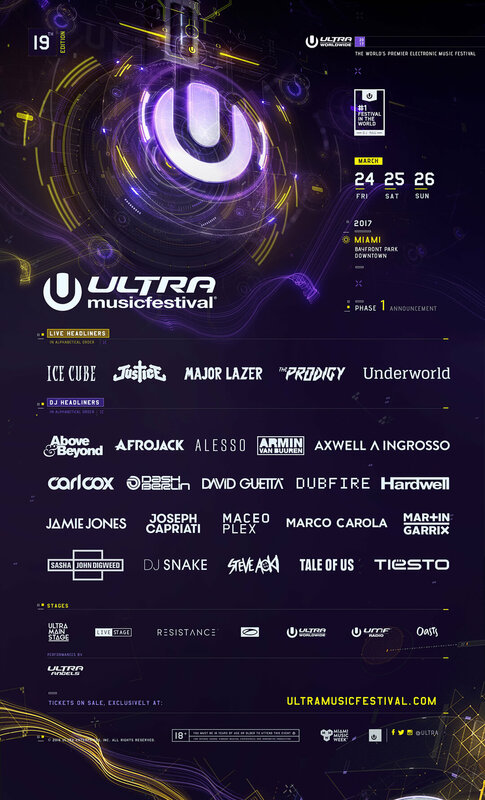 With every genre across the electronic music space represented by the biggest and freshest acts on the planet, Ultra Music Festival 2017 is not to be missed. The 2017 edition of Ultra Music Festival takes place at Bayfront Park, Downtown Miami, on March 24, 25 and 26 and is an 18+ event. Tickets for Ultra Music Festival 2017 are now on sale at ultramusicfestival.com.